In Accelerating Academia: The Changing Structure of Academic Time, Filip Vostal examines how speed has become a key pressure within higher education through interviews with twenty academics based in the UK. While the empirical research could be broader, Luke Martell highly recommends the book for offering considered, inquiring reflections on the structures that are contributing to the acceleration of academic life. 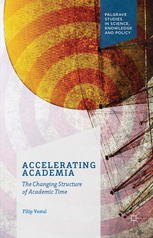 Accelerating Academia: The Changing Structure of Academic Time. Filip Vostal. Palgrave. 2016. Academics are reeling under authoritarian management, marketisation and audits. A rewarding occupation is situated in an institutional context that’s not so benign. 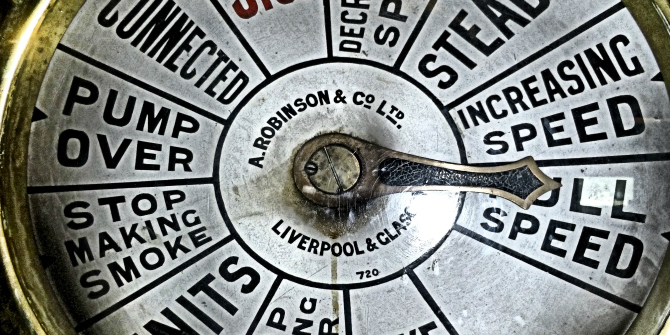 Speed is a key pressure in a profession where deliberation and a measured pace are especially important. Filip Vostal asks questions about this scenario. His Accelerating Academia: The Changing Structure of Academic Time is an opportune intervention on a pressing issue, assessing the literature and making his own empirical contribution. The field of Accelerating University studies is lively and progressing, and Vostal is a key participant. His book sorts through perspectives on speed in academia well, concisely and with a balanced and critical approach. Vostal interrogates the case that universities are “fast”, and questions whether, if so, this is problematic. His focus is on the UK, but the literature covered is cross-national and the book’s themes and relevance are wide. One chapter focuses on sociology, but the book is not limited to the social sciences as his interviews are undertaken with academics across disciplines. The book starts by introducing acceleration and its theorisations, and goes on to detail how capitalism encourages speed. It outlines the role of the knowledge economy as an idea in acceleration using the concept of vehicularity, and also utilises the notion of performativity to explain how rhetorics of competiveness and excellence play their part. Vostal then proceeds to his interviews with academics and looks at “fast sites” in academia through which speed is pushed, like business incubation units. It finishes by assessing the extent to which big data, digitalisation and the growth of audits escalate acceleration in sociology. Unlike analyses that focus on neoliberalism or ICT as being behind it all, Vostal situates acceleration in the academy within the longer-running and broader context of modernity and capitalism. He takes on board much of the case for academia being under pressure to accelerate, with negative consequences. But he doesn’t see speed as all-encompassing or completely structurally determined. Instead, Vostal argues that speed is usually presumed to be negative and, consequently, slowness to be positive. But fast isn’t always bad and slow is not always good. This questioning and even-handed approach is one of the strengths of the book and Vostal makes a good, discriminating case for his interpretation. Image credit: Full Speed by Kate Russell. This work is licensed under a CC BY 2.0 license. Vostal’s interviews with 20 academics delve down to the level of agency. Accelerationist pressures and their damaging effects are accepted by those Vostal spoke to. But some report finding space to go slow and enjoy, embrace, juggle and wrestle with speed as well as resent it. Vostal himself writes that it is a fundamental limitation that most of the interviews were with senior academics at a high-status university. A wider span to take in less elite universities and a broader range of types of staff, including more of the many precarious academics on exploitative contracts, would lead to a different picture. You can’t cover everything but gender, ethnicity, sexuality and class, and how they affect academics’ experience of speed, don’t come up much or the situation at universities in the Global South. The book is about academia so it’s reasonable that Vostal didn’t go beyond academics, but further research could. Student mental health is a major problem at universities; pressures at the root of acceleration are part of it. Employees who support staff and students, clean, cater and take care of university estates could also be taken into account. Beyond higher education, workers such as delivery drivers will have a word or two to say to academics about speed. But Vostal is clear about the greater security, status and power that allow some academics to resist the pervasiveness and damaging aspects of speed. It would be further useful to interview managers and incubation leaders to test the claimed centrality of speed to them, as Vostal did for academics. My hunch is they’re more concerned with money and conformity than acceleration. I’m not sure that marketisers say that much that universities used to be too slow, as Vostal suggests. Their preoccupations have been more about issues of efficiency, savings, consumer satisfaction, competition and economic impact, the last two of which are given significant space by Vostal. In general, Vostal may read speed too much into the priorities of “fast sites” at universities (though on occasion he does question this himself, 160). They are about commerce, which may need speed sometimes but often careful and systematic planning (of a sort that Vostal outlines, 153-54) that takes time. In the literature on acceleration, speed is sometimes substituted for other things. Vostal isn’t alone in generally interpreting pace into advocacies of competition when the core thing being promoted is mainly just the competition (as he does on occasion suggest, 157). Speed is often a symptom of something else: competition, for example, being the key thing, a cause of acceleration rather than synonymous with it, and not always requiring speed for success. The underlying issue may not be speed but a quantity of tasks that can only be done by rushing. Many academics point the finger at the audit culture, when equally behind acceleration is the older problem of the sheer amounts of teaching and marking, and limited time to do research properly rather than in haste (picked up in the literature and interviews Vostal discusses). It may be hours worked or the variety of tasks to be juggled as much as speed that is the heart of the problem. These are more long-running than neoliberalism. So marketisation, metrics and managerialism at universities may have institutionalised and piled on the pressure to do something we already did, as Vostal notes, adding insecurity and fear. At the same time, university managements avoid responsibility for stress at work. Their response is to individualise, displace and therapeutise it, offering time-management advice to staff rather than addressing their managerial role in excessive workloads. Speed isn’t primarily an individual choice; it’s about structures. But academics can be ambitious and competitive which drives their speed, and these can be self-adopted as well as externally driven, something that also crops up in Vostal’s interviews. Collective organisation could solve a lot of our problems, but some staff treat unions as “them” when they are “us”. Academics are better at criticising the marketisation of society than resisting the marketisation of higher education; more radical in print than in university meetings and the everyday practice of their job. At worst, they are complicit in the processes they condemn, for instance, the REF. I think that on balance we need less fast and more slow, but Vostal is right to argue that the issue is less about speed and more about autonomy from structures of power that force speed. Picking up where he leaves off: if autonomy is the issue, then how do we regain control? One way is through greater collective power. The proportion of staff and students on university governing bodies has shrunk, while managerial and business representation has grown, consultation has become a sham and the questioning of top-down management is dismissed. University governing bodies need to be made up more by the citizens of universities, and we need stronger unions, which means more member involvement. An alternative is autonomy gained through co-operative universities, like free universities run by tutors and students. Another approach is leaving the university for self-employment. I recommend Vostal’s book highly. He gives us considered, inquiring reflections across a broad literature on neoliberalism and speed at universities, and is critical, fair and constructive. The empirical research is limited by the range of interviewees, but provides revealing information that brings a fuller picture and is the foundation for further research that is more inclusive. Vostal’s work is a basis for pursuing solutions and alternatives. These require collective action tackling power. Luke Martell is Professor of Political Sociology at the University of Sussex.